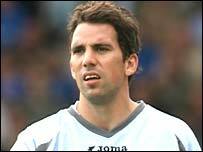 Cardiff City boss Dave Jones has told goalkeeper Neil Alexander he will not receive an improved contract offer. Alexander made crucial saves to give the Bluebirds victory on Saturday, but the Scottish international could be on his way out in the summer. "We've made the offer to the agent and by what we've heard it's not acceptable," said Jones. "We have to cut our cloth accordingly and the days have gone at this club where players are on big money." Jones added: "I hope he signs the new contract but if he doesn't I'll just get on with it. I don't worry about players who don't want to play for me." Alexander, who has won three Scotland caps, joined Cardiff in May 2001 and has made over 200 appearances for the club. Contract talks have been on-going since December, when the 28-year-old first rejected Cardiff's offer.